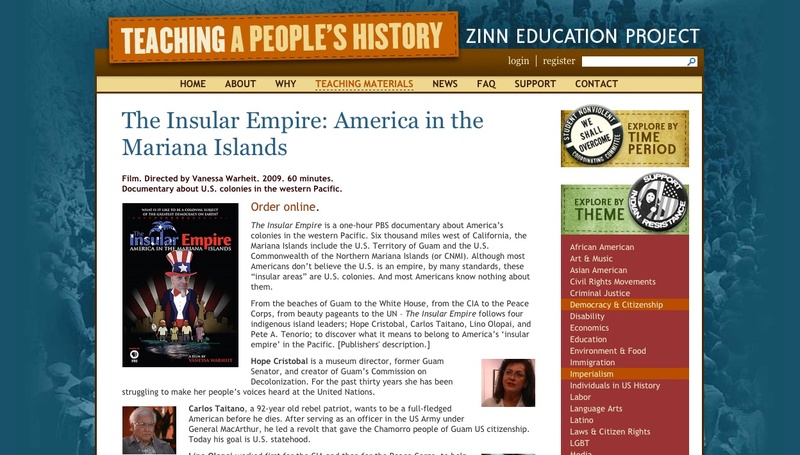 The Insular Empire recently received the huge honor of being included in the Zinn Education Project‘s list of Teaching Materials. The ZEP project promotes and supports the use of Howard Zinn’s best-selling book A People’s History of the United States and other materials for teaching a people’s history in middle and high school classrooms across the country. The website offers more than 100 free, downloadable lessons and articles organized by theme, time period, and reading level, and information about films – like mine – that address lesser-known chapters in American history. For those of you who haven’t yet had the pleasure of reading the late Howard Zinn’s works, you are in for a treat. Whereas standard history books focus on the winners – the capitalists, the generals, the men, the Europeans – Zinn’s work focuses on everyone else. Women, slaves, laborers, Indians – and those struggling to make life better for all of us (40 hour work week, anyone?) are finally given their place in the academic sun. Plus Zinn was just a great writer – and a great speaker. The Zinn Education Project is coordinated by two non-profit organizations, Rethinking Schools and Teaching for Change. The people who are carrying on Zinn’s tradition with this new project are as committed, smart, and karmically positive as he was. I am truly honored to have my work included in their project. Be sure to check it out!